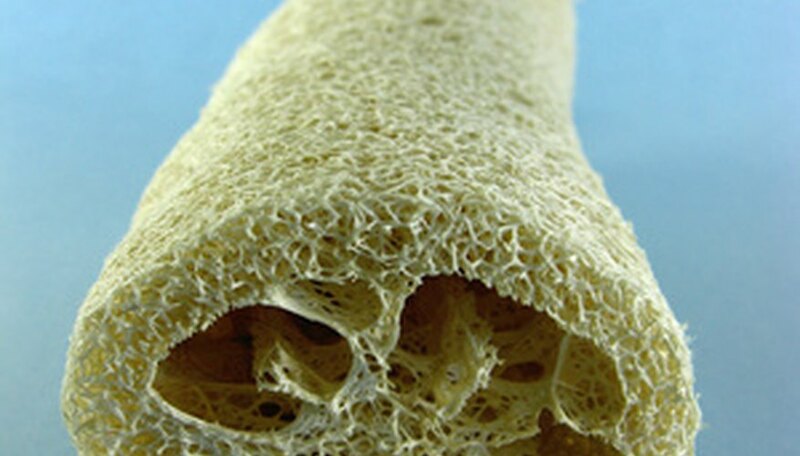 Loofah sponges, also known as luffas or sponge gourds, require a long, warm growing season to reach full maturity, and may not fully ripen in cool climates. In USDA plant hardiness zones 5 through 10, however, loofah plants typically thrive and produce sponges before the first frost. Mature fruits become sponges after harvesting and drying, and because these vigorous, climbing plants cannot tolerate cold temperatures, they are treated as annuals and discarded at the end of the growing season. In addition to the valuable fruits, loofah sponge plants also produce yellow, edible flowers and attractive foliage and vines. Start loofah seeds indoors in cell packs in mid April to ensure all danger of frost has passed. Soak the seeds in warm water for 24 to 48 hours prior to planting in the cell pack to initiate germination. Dampen the soil in the cell packs once every three to four days to keep it from drying out completely. Transplant loofah sprouts into the garden during mid-May. Choose a planting site that receives full sunlight and is near a fence or trellis at least 5 to 6 feet high. Form small hills in the soil 4 to 6 inches in height and 6 feet apart. Plant one to three loofah sprouts in each hill. Apply a 1- to 2-inch layer of organic mulch to the soil surrounding the loofah hills. Replenish the mulch whenever necessary to keep the layer at about 2 inches thick. Do not pile the mulch on top of the hills, as this can result in disease and prevent growth. Water loofahs once every five days to keep the soil consistently moist, yet not soggy. Apply water directly to the soil, as moist foliage is more susceptible to pests and disease. Do not water on weeks that receive more than 2 inches of rainfall. Reduce watering frequency to once every week during late summer. Fertilize loofah sponge plants once each month using a complete 10-10-10 NPK fertilizer to provide plenty of nutrition for vine, flower and fruit formation. Decrease the frequency of fertilization to once every two months during late summer. Apply according to the manufacturer's instructions. Train the loofah sponge vines to climb the support structure by hanging each vine over the fence or trellis as it grows, and soon the vines will begin to climb on their own. Use garden twine to secure young vines to the structure if necessary. Never allow fruit to sit on the ground, as it will quickly rot and become unusable. Harvest loofah sponges immediately after the first frost of the season when the outer skin on the fruit begins to turn yellow and brown. Grip and twist the sponge from the vine gently until it breaks off. Turn the loofah fruit into a sponge by breaking off the bud end of the fruit and shaking out all of the seeds. Submerge in water for five to seven minutes, then remove the outer skin and pulp. Trim any excess material from the sponge and allow to air dry in a sunny location for six to eight hours. Store in a dry location until ready to use. Use grass clippings or chopped leaves as organic mulch for loofah plants. Remove any gourd from the vine that has spots or shows signs of rotting, as they cannot be saved and will only drain the plant's nutrients.